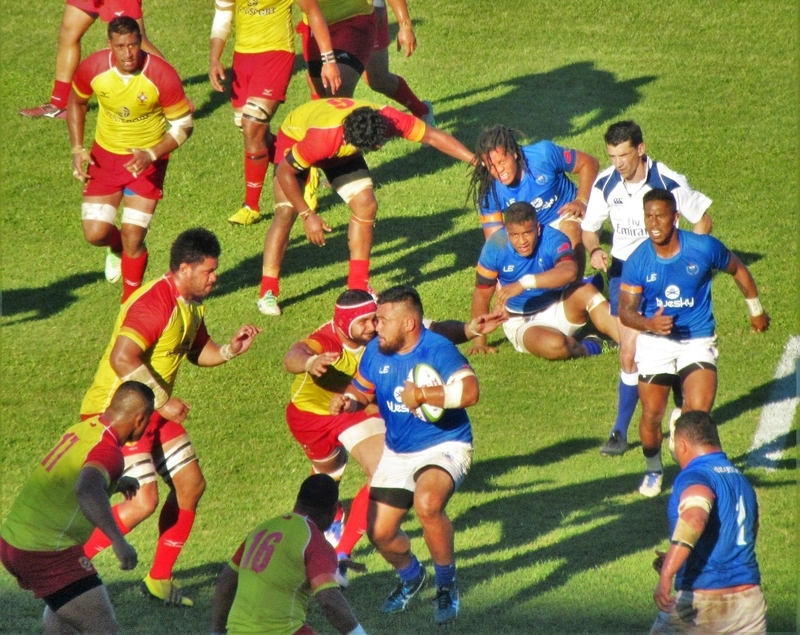 Samoa (blue) slams Tonga 30:10 in a Pacific National Cup match to qualify for the Rugby World Cup. North of Tonga is its big brother and competitor Samoa. 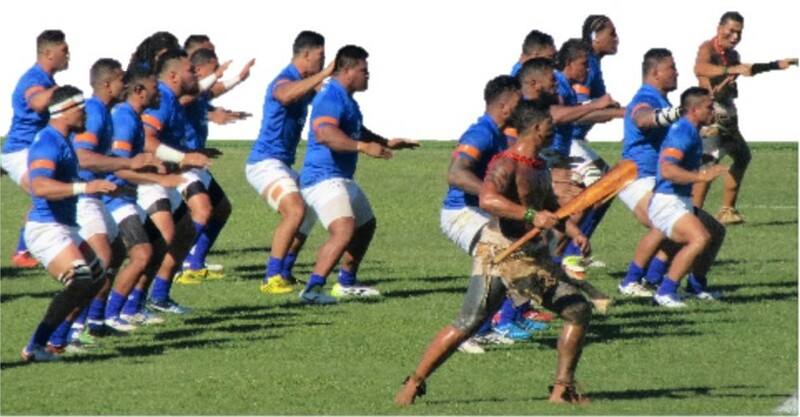 • Samoa has twice as many people (200K vs. 100K) as Tonga. • While Samoa has four times the land mass of Tonga, it's only about the size of Rhode Island or Luxembourg. Historical accidents a century ago resulted in the Samoan people being divided into the U.S. territory called American Samoa and, to the west, the now independent country of Samoa (previously under Germany, then New Zealand). My favorite afternoon in Samoa was spent... attending my first rugby match. This was not just any rugby match either. 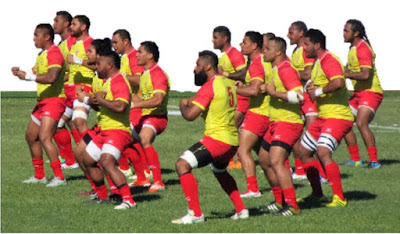 Despite their small populations, these two countries have often been in the top twenty of rugby nations. Currently, they are ranked 14th and 15th in the world (ahead of the US, Canada, Germany, and most others). 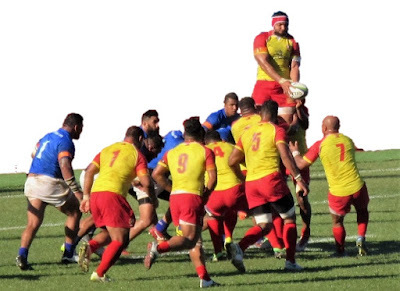 This match was part of the "Pacific National Cup" competition to determine who advances to the Rugby World Cup. 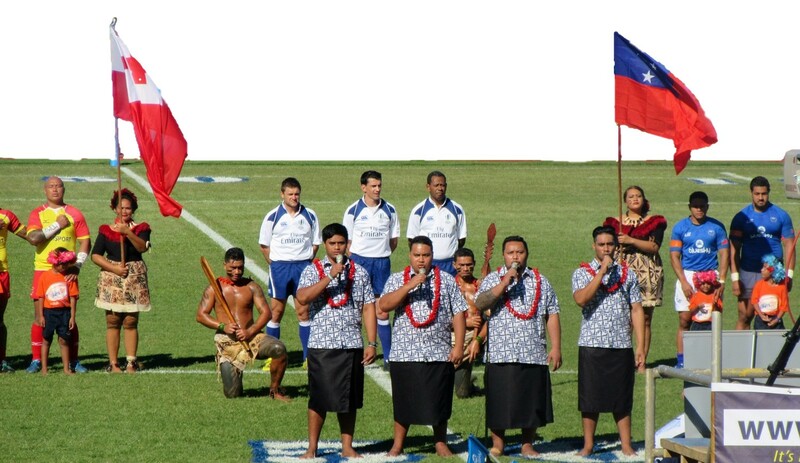 Pageantry of the opening ceremony of Samoa-Tonga rugby. Quartet sings both national anthems. Players march onto the field and dancers prance around. The President of Samoa and his wife make their entrance. Then the teams performed their awesome ritual "war chants." Left: Handsome modern shaded stadium in a scenic location in Apia. Right: Samoa's first half lead, shown above, proved insurmountable. The crowd seemed subdued, except for some boisterous Aussies. Lifts to catch the lineout toss are always cool plays. Any way that American football can employ this move? In the second half, Tonga dominated many of the scrums but it was too late. Afterward, the Methodists, Mormons, Catholics and others bow heads in prayer. Friends Allan, erstwhile Brit and former varsity rugby star at Oxford, and Canadian Sue patiently explained rugby rules and tactics to me. All in all, I'm still not willing to swap American football for rugby but it was enlightening and great fun to see these two important teams from these two small Pacific neighbors play a consequential game. Samoan schoolkids waiting for transport and posing for the cameras. Like neighboring Tonga, Samoa also has powerful blowholes. The Alofaaga blowholes are on Savai'i island. Obligatory photo of me in the country. Sometimes I neglect to get one. 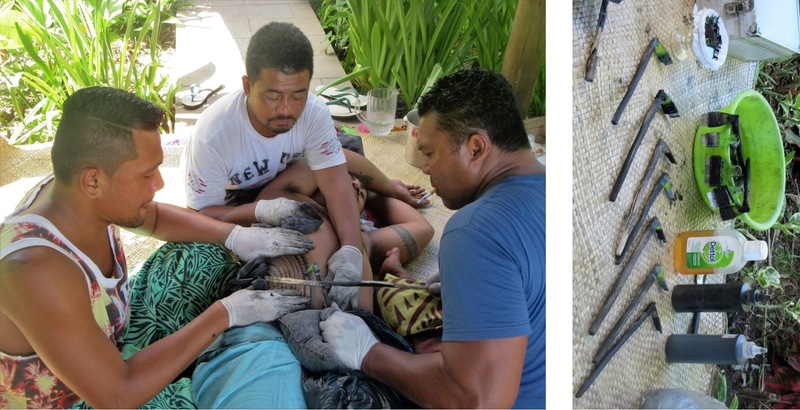 Getting a big tattoo the old fashioned way ― with a hammer and chisel ― taking days and thousands of dollars. Golden sunrise one morning in Samoa.